The hardest part about writing this article was what to call it. 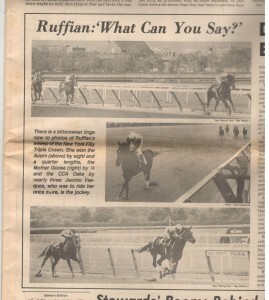 Yes, it’s about Ruffian, arguably the best and most brilliant filly to ever grace the racetrack. But it’s about more than that. It’s about the love of The Sport of Kings, it’s about the Golden Age of Racing, it’s about the love and dedication to the Thoroughbred so many of us share, and it’s about how fate brought a team together to try and do the impossible. Out of love, no different than one would love a family member, this team of dedicated, devoted horse people, from almost every level of the game, tried with all their skill and hearts, to defy insurmountable odds. While this is an article about Ruffian, you will meet many other people, each remarkable in their own way, and each worthy of their own story. This story is about Ruffian; however, and the rest of us are just privileged to be along for the ride. Although you’ll learn a lot about some great people, none of it will change our focal point, which is this magnificent specimen of a racehorse. You’ll get to know some of the best and most dedicated people in the business, and of course you’ll even be treated to a “Damon Runyanesque character. I’m not sure there could be a real racetrack story without one. This is certainly not the first time the story of Ruffian has been told, and only time will tell if it is the last. It is, however, the real story, with her greatness defined, and an accurate account of what truly happened that fateful day by people who were there. The sad and inescapable part of the story is the horrible loss and tragedy our sport suffered that day. But, we will also celebrate her brilliance and achievements and recognize the love and dedication she was surrounded with in those final hours, minutes and seconds. Not only will we celebrate her brilliance, but be thankful for the glimpse The Sport of Kings provided us into what she truly could have become, had fate, in one of its cruelest moments, not stolen her away from us. 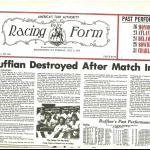 When finished, you’ll know more about Ruffian than most, and you’ll know what did and didn’t happen at Belmont Park on Sunday, July 6th, 1975. Much was written about the aftermath of that fateful moment in our sport. I’ve known for a while most of what was fact and fiction. I feel both honored and privileged to tell it as it was and not as was widely reported over the years. This account comes from those who were there, involved, and who loved her and our game as much as anyone. While reflecting on a conversation with Mike Bell, a man who probably spent as much time with Ruffian during her racetrack career as anyone, the title came to me. It was just how he said it as we were discussing her career, and how good she actually was. It was so matter of fact, and with such confidence, and just made sense. Mike said “just look at her past performances, all you see are 1’s, all 1’s”. He was right. It was all 1’s, a rarity throughout the history of The Sport of Kings. Even more of a rarity when you consider she competed almost exclusively in stakes, five of them being Grade 1’s. There are those 1’s again. Ruffian finished ten races, winning them all, and was never headed at any call in any of them. Again, five, or half, were Grade 1’s. Impressive to say the least. I can’t take credit for “The Real Story” either. That goes to Raymond J. DeStefano. You’ll learn more about Ray later, and why he, as much as anyone, can call this “The Real Story”. Even more impressive and rare in my opinion, is Ruffian was able to go wire to wire at 5 ½ furlongs and at 1 ½ miles. Ruffian set a new stakes record in each of her eight stakes victories. She also equaled two track records. She broke her maiden first out by 15 lengths in record time. Not many horses win 5 ½ furlong races by 15 lengths in record time and go on to win at a mile and a half in stakes record time. Her average winning margin was just over 8 lengths. 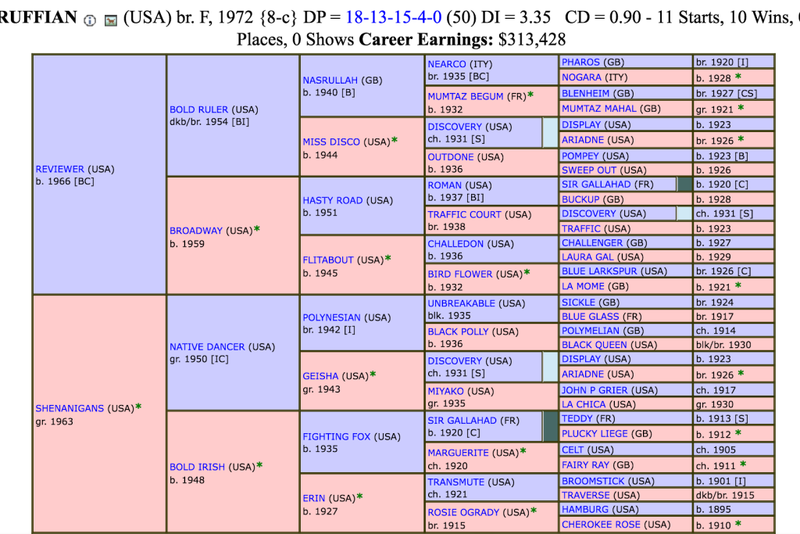 An impeccable and enviable resume for any horse of any era. A glance at her past performances puts her squarely at the top of any knowledgeable discussion about the bests of all time. Actually seeing her run ends the conversation for many. I was fortunate enough to see nine of the ten races she completed. I was unfortunate enough to see the one she did not complete as well. I learned a lot about Ruffian from talking with Mike Bell. Mike is a knowledgeable horseman and his love of the thoroughbred, Ruffian, and game was evident very early on in our conversation. He’s a true professional and that comes across immediately. 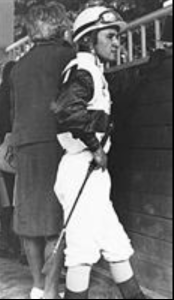 Frank Whiteley Jr. was Ruffian’s trainer. Mr. Whiteley was what I refer to as “Racing Royalty”, a term reserved for the best of the best breeders, owners, trainers, and riders. He trained horses like Ruffian, Forego, Damascus, Tom Rolfe, amongst many others. Mike was Mr. Whiteley’s barn foreman back when they had Ruffian. 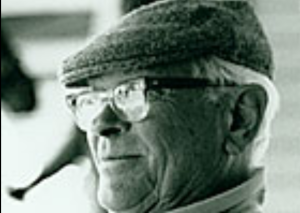 Barclay Tagg, was Frank’s assistant trainer, and Barclay would go on to win The Kentucky Derby with Funny Cide in 2003. The duties in the barn were dispersed pretty evenly. They all shared in the care of the horses and it was not uncommon for Mr. Whiteley to delegate different duties to different people. As such, Mike did just about everything in the barn at one point or another, just as the rest of the team did. Much of what he did was take care of Ruffian. Mike described Ruffian as a very independent filly. She was free spirited and did not like being fooled with and let you know it. She was not uncooperative, but all business. If you had to do something in her stall, you went in, did it, and got out. That’s how she wanted it. She was competitive and liked going to the track. She knew what was going to happen when she went to the track and you could tell she enjoyed her job, and wanted to do it and do it fast. Great horses are that way, as are most great athletes. Ruffian was a big strapping filly, built more like a muscular stallion than a filly. Prior to that fateful day, the unbeaten, untested, and never headed Ruffian only had one potentially serious setback in her career. She sustained a hairline fracture of her right hind ankle, which was thought to have occurred during a morning gallop prior to The Frizette Stakes. The injury occurred in late September of 1974, Ruffian’s two-year-old season, and sidelined her for the rest of the year. She spiked a fever which caused her to miss The Frizette. After the fever subsided, Ruffian just didn’t seem right. Her regular veterinarian, Dr. James Prendergast, one of the best in the business, and a true animal lover, and the veterinarian of choice for racing royalty like Frank Whiteley Jr., estimated the injury to require six to eight weeks to heal. He discovered it after having a series of radiographs taken. She remained under the care of Dr. Prendergast, until she wintered in Camden, South Carolina, as was customary with Mr. Whiteley’s horses. Noteworthy, is Frank Whiteley Jr. and his staff, including Mike Bell and Barclay Tagg and the rest of the team, were hay, oats, and water people. True horsemen. No Lasix, very little medication, and veterinarians were summoned to primarily treat injuries. Equally noteworthy is veterinary medicine and science was not what it is today. Everything from diagnostics to treatment has changed. Sure radiographs were available but today the tools at a veterinarian’s disposal are vast, as are the drugs. They were much more limited back then yet just as successful, arguably more so. More so because of the accomplishments of our equine athletes of that era. 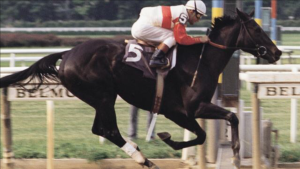 Ruffian, along with many other equine stars of the golden days of racing achieved their greatness without Lasix, and other drugs routinely used today. Their accomplishments were no less, more probably, but without the aids horses so commonly have today. Hay, oats, and water, along with a good trainer and rider, as well as a top notch veterinarian to patch things up were all that was needed. The horses’ careers lasted longer, and they ran more often and just as fast. Things have changed, but we’ll come back to that later. 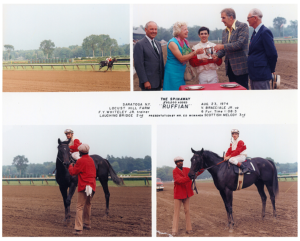 There was little question Ruffian was fine when she made her three-year-old debut in 1975. She ran six furlongs off an eight-month layoff in an Aqueduct allowance race, one of only two times in her career she did not compete at the Stakes level, in an eye catching 1:09.2. Her next start was The Grade 3 Comely Stakes, also at Aqueduct. She broke slowly but still was in front by the first call, and went on to win easily by over 7 lengths, covering 7 furlongs in 1:21.1. Racehorse time. The three quarter (6 furlongs) split was 1:08.4. There was no doubt she was fast, among the fastest, but it’s rare for a horse this fast early to be able to carry that speed a distance. A mile maybe, especially if it’s one turn, but any longer than that, and stretching into the two turn arena becomes iffy. This wasn’t just another great racehorse. This was Ruffian. From The Comely, Ruffian went on to trounce both her foes and the clock, sweeping what was then called The Filly Triple Crown. She won The Grade 1 Acorn at a mile in 1:34.2. She took The Grade 1 Mother Goose, then run at Aqueduct at a mile and 1/8th, around two turns in 1:47.4. This was Ruffian’s first endeavor around two turns and she left no doubt it was well within her scope. She drew off to win by over 13 lengths, making a strong case she was getting better as she was maturing and going longer. 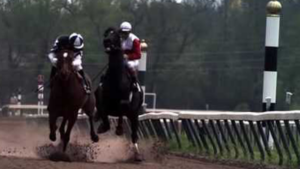 Ruffian’s Mother Goose stakes record, and the record for margin of victory in the race, stood until Rachel Alexandra broke both on June 27th, 2009, winning the race in 1:46:33 by just over 19 lengths. However, the Mother Goose is now contested at Belmont Park and run around one turn, in an elongated sprint format, thus speeding up the times. Taking nothing away from Rachel Alexandra, a brilliant filly in her own right, the races were run under very different conditions. 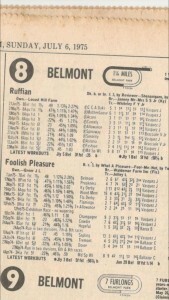 To complete The Filly Triple Crown, Ruffian would have to return to Belmont Park, and run further than she had ever before. The final leg of the series was The Coaching Club American Oaks, run at the same grueling distance, a mile and a half, as The Test of Champions, The Belmont Stakes. Everyone knows a front runner with 21/44 speed can’t go a mile and a half. Nonsense. Ruffian was all heart and racehorse and distance was not going to be her undoing. Nor was competition. She loved racing and her competitive spirit made her want to win. As we watched this big, strapping, almost all jet black filly make a mockery of any distance limitations, little did we know fate was getting ready to play a cruel hand and this was the last race we’d ever see her complete. Continuing her streak of track and stakes record times, Ruffian handled the 1 ½ miles with ease, stopping the clock at 2:27.4. I remember going down to the rail on the apron at Belmont that day and just gazing at her. I knew I was seeing something special. I think everyone did. I remember when I was just a kid, seeing Ruffian at Saratoga. I went to Mangino’s on the lake for dinner with my Mom and Dad that night. As usual in August back then, the place was packed. All you heard from those waiting for tables, and those already dining, was what a great filly we all had witnessed that day. Ruffian dominated The Spinaway. 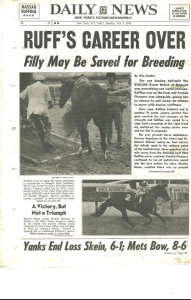 Ruffian handles The Test of Champions distance of 1 ½ miles, the same distance of The Belmont Stakes, with ease completing the filly Triple Crown. This is her final race before The Match Race, and the last race she completed. Horse racing was more mainstream back then. 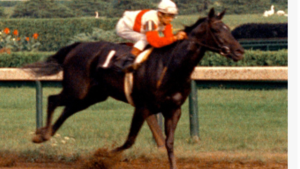 Horses like Ruffian did not need social media to catapult them to stardom. The Sport of Kings was covered by most newspapers and sporting magazines, and Ruffian was its new star, and she was a girl. More so, she was unbeaten, untested, never headed, all 1’s. There was no knock on her nor any limitations on how great she was or could be. 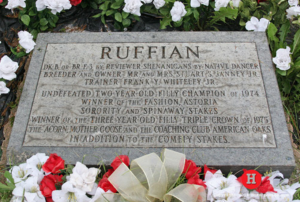 Had Ruffian never set foot on the racetrack again, she had already developed a Hall of Fame resume, and a record deserving of, at the least, mention when speaking of the very best the game has ever seen. Possibly, the best the game has ever seen. People today love to throw the word “freak” around when describing a horse who has run a fast or impressive race or two. I suggest being a lot more reserved with throwing that term around. I don’t use it often. Ruffian would qualify. Social media has created a platform for countless arguments and discussions about things like who was better, Zenyatta or Rachel Alexandra, and who was the best of all time. Taking nothing away from any of these great horses, all special in their own right, it is almost impossible to compare horses from different eras, and horses who have never lined up against each other. Almost I said. With Ruffian we may get some separation and I’ll explain why. In a conversation with legendary Hall of Fame rider Mike Smith I had while interviewing him for a prior Past the Wire column on The Breeders’ Cup, we discussed comparing horses from different eras and horses who never raced each other. Mike’s one of the best ever and has ridden some of the best and has a great opinion. We were in agreement it is hard to compare. Horses are athletes, and athletes often perform to their competition, and react to their adversaries just like human athletes. Unless you put them in the gate you just don’t know. You can think, form a bias, have an opinion, but unless you race them, you don’t know. Some horses run as fast as they have to, some horses ease up when in front, some horses relax when they know they’ve got it won. The thing that creates some separation with Ruffian is “All 1’s”. That’s her past performances in a nutshell. “All 1’s”. She led at every call of every race she finished. She consistently ran fast, early and late, and broke or equaled the track or stakes record in every start she finished. Every one. She did this from 5 ½ furlongs to 1 ½ miles, and was just coming into her own. Who can make that claim? She was before Thoro-Graph, but I’d love to see her sheet had she had one. According to Jerry Brown, the founder of Thoro-Graph, and who worked for The Ragozins at the time, Ruffian ran a lot of 5’s on ‘The Rags”. That was very fast for a three-year old filly back then. For a variety of reasons, horses run lower figures in general today. 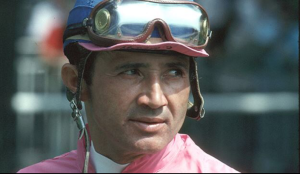 Perhaps Jacinto Vasquez, also one of the best riders ever, with a great opinion, said it best “she was like Marilyn Monroe, there was everyone else, and then there was her, Ruffian. Just like Marilyn Monroe, there was everyone else, then there was Marilyn Monroe”. The 70’s were a time when the women’s liberation movement was making news, and competition between men and women were usually headlines in sports. Just two years earlier in 1973, tennis star Billie Jean King, a woman, beat tennis pro Bobby Riggs, a man, in a highly publicized match dubbed “The Battle of the Sexes”. People liked seeing male-female competition and the women’s liberation movement fueled that, especially if the woman could win. Was that what prompted the match race? Probably not entirely, but it was likely contributory. The hype leading up to what they initially called “The Great Match” was tremendous. Racing fans went into a frenzy over seeing the magnificent, untested filly, Ruffian, go at it head to head with the battle hardened, experienced colt, Foolish Pleasure, that year’s Kentucky Derby winner. Pins and T-Shirts were given out. The press coverage was constant and the buildup kept intensifying. Not everyone was in favor of The Match Race. Ruffian’s trainer Frank Whiteley Jr. has since passed so I could not speak with him, but I got the impression he was not in favor of it, but went along with it due to the popularity, hype, and thinking she’d win anyway. In the wake of the women’s liberation movement and all the hoopla surrounding it, a lot of people saw this as good for racing. That sort of created an unspoken pressure at the racetrack to be in favor of it. After all, it would be good for the game, and it was mainstream because of the times. Ruffian was owned by the Janneys, cousins of the Phipps, and at that time, Ogden Phipps ran New York Racing. Mike Bell, Mr. Whiteley’s barn foreman, has never been in favor of racing fillies against colts. Nobody had a crystal ball, and nobody anticipated the unimaginable, so I don’t think you can really fault those who wanted ‘The Great Match” and saw it as good for the sport. The Janneys and Phipps were connected by more than blood. They were both major breeding families, and bred most of their horses at Claiborne Farm. 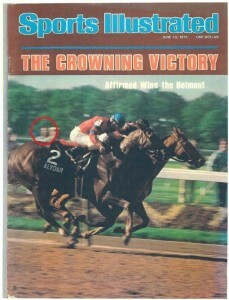 The Phipps owned Reviewer, Ruffian’s sire, and the Janneys owned her dam Shenanigans. Reviewer was a son of another Phipps stallion, Bold Ruler, who also sired Secretariat. Had it not been for a lost coin toss, The Phipps family would have owned Secretariat. Secretariat went to Meadow Stable, the owner of his dam, Somethingroyal, and the winner of the famous coin toss. 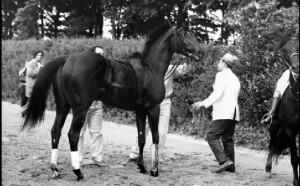 Ruffian was born on April 17th, 1972. Secretariat made his racing debut in July of 1972. Jacinto Vasquez, Ruffian’s Hall of Fame rider, and again, one of the best ever, was never in favor of it. He felt it was pointless and would prove nothing. 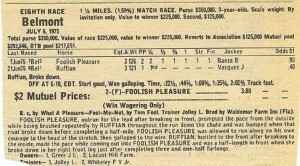 Interestingly, Jacinto Vasquez won The Kentucky Derby earlier that year aboard none other than Foolish Pleasure. Jacinto chose to ride Ruffian in the match race, and never thought Foolish Pleasure, a heckuva racehorse himself, had any chance to beat her. Jacinto Vasquez would know too. His Hall of Fame career put him on some of the best horses ever. Vasquez won The Kentucky Derby twice, aboard Foolish Pleasure, and on Genuine Risk, one of only three fillies to ever win it. He rode horses like Forego, Storm Cat, Smile, Princess Rooney, Ta Wee, Numbered Account, and so many others. He is also the only jockey to beat Secretariat two times, on Angle Light in The Wood Memorial, and in a great ride on Onion in The Whitney, where he had Big Red pinned down on the inside. If Jacinto thought Foolish Pleasure, his Derby winning mount, had no chance of beating Ruffian, I’d pay attention. We’ll hear more from Jacinto Vasquez later, in one of the most compelling conversations about that fateful day that ever took place. The momentum, hype, and popularity was way too strong, the Match Race would take place. It didn’t matter who was against it, the boulder was rolling down the mountain, and nothing was going to stop it. In all fairness, what was to come could not have been anticipated or expected. Had it been, it goes without saying there would have been no Match Race at Belmont Park on July 6th, 1975. Unfortunately, The Sport of Kings inherently brings with it at times both the unexpected and the unimaginable. Frank Calvarese was the assistant starter in the gate with Ruffian that fateful day. Frank was one of the best, and everyone on the track, including most trainers and riders, knew it. Frank handled many great horses in the gate. And was starter George Cassidy’s go to guy for the best horses. It wasn’t always that way. One day the great Kelso finished second, beaten a neck in a race. His trainer Carl Hanford, blamed a poor start and went to starter George Cassidy and asked for Frank to handle Kelso going forward. George obliged. Kelso went on to be Horse of the Year five times while being handled exclusively by Frank in New York. Frank handled all the Greentree Stable horses for John Gaver and later his son Jack. He handled the Bohemia Stable horses for Allaire Du Pont, he handled horses for Joan Payson, William Hagin Perry, Mike Freeman, and almost always by request. This great horseman, and lover of the game and thoroughbreds, lived it his whole life. He started at 15 years old as a hot walker and groom at Delaware Park near his childhood home. Ultimately, while in Florida, he learned of an opening on the gate crew at Hialeah, then one of the premier tracks in the country. He was granted an audition, as he called it, by Hialeah’s starter George Cassidy and got the job. Frank was thrilled. Little did Frank know at the time, the path he chose, for primarily stability reasons, would put him square in the midst of one of racing’s saddest moments; however, there were also many happy moments. Frank’s work on the gate got him invited to the racing royalty farms of the horses he handled to dine and socialize with their owners and breeders. He sat in the box of Joan Whitney Payson, founder of The New York Mets. Frank handled many of the best, and enjoyed many of the the perks and relationships that grew out of it. Frank handled all of Frank “Pancho” Martin’s horses including Sham. There was one exception. That was if Secretariat was running, as only Frank handled Secretariat. That was at the request of both Lucien Laurin, Secretariat’s trainer, and his rider Ron Turcotte. Frank also mentored Raymond J. DeStefano during his time on the gate. Frank knew Ruffian well. He’d been in the gate with her many times. He also was entrusted with “the book”. The book, as it was called, contained notes on any horses with gate issues. You did not dare lose the book if you were holding it. It was usually entrusted to the foreman or a key member of the gate crew. Different quirks and habits were in the book. Who got nervous or keyed up, who was timid, who needed to be held, just about any type of gate handling instructions. You’d find things like who needed a blindfold, who needed to be buggy whipped, who needed to be backed in, whatever. Improvements were also notated and sometimes horses were removed from the book altogether. Today the book is likely an I-Pad. Ruffian was in the book. She was not known as a bad gate horse but was known as anxious. She wanted to run, and if you let her, she’d charge the gate before it opened. If she saw racetrack, she wanted at it. Frank says Ruffian was built “like a bull”, and looked “like a stallion” not a filly. Frank would handle the powerful filly’s head in the gate and sometimes keep it slightly turned so she would not focus on the racetrack in front of her. There was always that concern of her charging the gate, but Frank, a true professional and master at his craft, knew how to avoid it and simultaneously make sure she had a fair start. Raymond J. DeStefano, whom I’ll refer to as Ray, and count amongst my dear friends, is a remarkable human being and race tracker. He could have been anything on the racetrack he wanted, with perhaps the only exception being a jockey, and among the best at whatever it was he chose. His love of horses at a young age brought him into The Sport of Kings, and he has never left. He has had one of the most interesting, successful, and diversified careers on the racetrack as anyone. 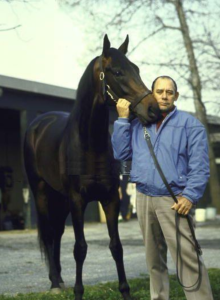 As with his gate mentor, Frank Calvarese, who could have imagined this love of horses would make him a part of racing history, and place him in the unenviable position of spending Ruffian’s final hours and even seconds with her. But for fate, Ray’s passion and love for horses may never have been realized. Ray was born in Brooklyn, New York, but moved to Floral Park at a young age. The family home was several hundred feet from the fence to the Belmont training track. Ray could hear the Belmont crowd roar from his home and was fascinated. He could hear and even smell the horses on the training track from his home and this young man was drawn into The Sport of Kings where he has remained. Nothing was handed to Ray, and as successful as he became at every level of the industry he participated in, he had to work for it. His love of the racehorse really started with one of the all-time greats, Buckpasser, who was a two-year old at the time. Ray used to sneak onto the Belmont backside. 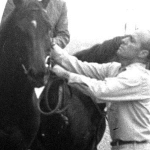 Eddie Neloy, Buckpasser’s trainer, became familiar with Ray and allowed him to pet and get to know this great horse. Ray became a more recognized face on the backstretch, although still too young to officially work there. 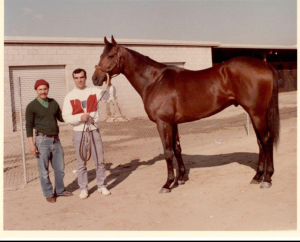 He then went on to develop a similar friendship with Dr. Fager, one of the fastest horses ever, and his great trainer and horseman, John Nerud. Ray also got to know the great Damascus when he was a stallion at Claiborne Farm. Ray spent a summer working at the historic farm as a college requirement. 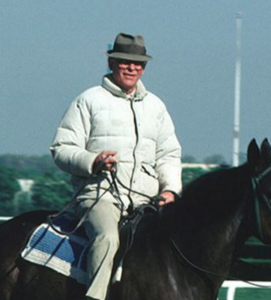 Besides the obvious friendships of both the equine and human nature sneaking into the Belmont backstretch afforded Ray, there was an added one, which would become influential and helpful to his career. Ray caught the eye of legendary trainer Frank “Pancho” Martin, who took a liking to Ray. Ray, while a high school student on summer vacation asked him if he needed any summer help around the barn one day, and Pancho handed him a shank, gave him a little test and ultimately a job. Ray began working for Frank Martin who was a kind and generous man. He helped a lot of people around the racetrack with very little fanfare made of it. He was a gentleman and was portrayed so inaccurately in the movie “Secretariat”, I personally could not watch it. Ray felt the same and relayed to me Pancho was hurt, offended, and even angry about it himself. I could see why he would be. Pancho was great with both claiming horses and stakes horses, and Ray learned a lot from him as Frank became his mentor and most people on the backside knew it. Ray became known as Pancho’s guy. Ray continued working for Pancho part time when he could but he went on to school, Cornell University, where he majored and earned a degree in quantitative genetics. This opened a whole new door of understanding breeding and the genetic make-up of the horse for Ray. When I have a breeding question even today, I’ll call Ray before just about any bloodstock agent I know. Ray also won the boxing championship while a senior at Cornell at 165 pounds by TKO. When Ray graduated from Cornell, he returned to his love and passion, the racetrack, full time. He was offered an Assistant Trainers position by Jimmy Picou, but turned it down. He ultimately accepted a job with Murty Brothers Horse Transportation, transporting horses all over the country and even the world. Ray made numerous trips all over the world, traveling to Japan, all over Europe, South America, and the United States, transporting horses like the international star Dahlia. 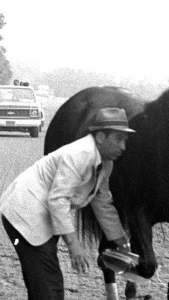 After Secretariat’s last race, a romping victory at Woodbine in October of 1973, his groom Eddie Sweat walked him off the plane and handed him off to Ray who loaded him onto a van that was bound for Belmont Park. 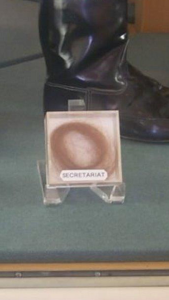 Ray pulled on Secretariat’s mane and a piece of it came off in his hand that he still has today. That piece of mane was actually on loan to the Racing Museum in Saratoga for a while. Ray has amassed quite the collection of racing memorabilia. He can open his own museum and it would have few rivals. 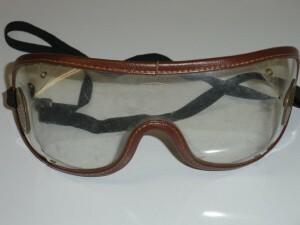 Jean Cruguet gave Ray the goggles he was wearing when Seattle Slew won The Belmont and Triple Crown, after Ray and Slew’s regular gate handler, Bob Duncan placed the famous carnations around Slew’s neck. He has many friends who have volunteered to clean out his home upon his passing, before his beloved daughter Bethany decides what goes in the trash. While working for Murty Brothers, Ray continued to enhance his reputation on the backside. He also started working for one of the best Veterinary surgeons in the country, Dr. William O. Reed whose hospital was maybe a quarter of a mile from the Belmont backstretch and right next to Murty Brothers. Penn Feed was also on the block and down on the corner was the well-known racetrack tavern Esposito’s. Dr. Reed’s associate was Dr. Charles “Chuck” Allen. Ray did prep work for surgeries, assisted in the operating room and worked in the recovery room. At one time while at Cornell, Ray considered becoming a veterinarian but opted against it. 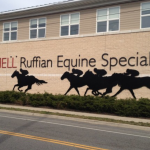 Ironically, Cornell University now operates The Ruffian Equine Hospital, which sits where Dr. Reed’s Hospital, Penn Feed, and Murty Bros. used to be. Ray was present and assisted when the great prospect, Hoist The Flag, was operated on and some of the bone chips removed from this great horse’s leg are part of Ray’s collection of memorabilia. Most of Ray’s things are pictures, racing forms and programs, but his experience at the hospital got him access to things like the Hoist The Flag bone chips which he kept. It was his love of horses and the game, and his being a student and historian of it that prompted him to collect these items. Ray was working for Dr. Reed and Murty Bros. in July of 1975. When things were quiet at Murty Bros., Ray would assist at Dr. Reed’s. In February of 1976 Ray learned there was a much coveted opening on the gate crew for The New York Racing Association, which consisted of Aqueduct, Belmont, and Saratoga racetracks. Frank Martin told Ray to tell starter George Cassidy that he sent and recommended him. Ray was given the job on the gate grew and mentored by Frank Calvarese. Frank showed him the ropes and Ray stayed there through 1984. Ray handled many of the top horses and top riders in the gate during that golden era of racing. One of my favorite pictures of Ray is the one where he is seen in the infield right near the wire as Affirmed and Alydar battled it out head and head in The Belmont Stakes. Ray has been close to historic horses and moments in The Sport of Kings his whole career. Ray worked on the gate crew until 1984. Afterwards, Ray was offered and turned down the position of Field Representative for The New York Breeders’ Association. He started doing bloodstock work on his own which he still does today. When the Inaugural Breeders’ Cup rolled around in 1984, Ray was asked by Slew O’ Gold’s connections, the favorite going into that first Breeders’ Cup Classic, to accompany the horse to California. Ray did and spent the days leading up to the race with the big horse who had a quarter crack that was being nursed along. 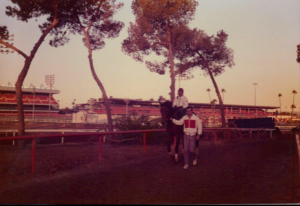 Ray walked the horse and Angel Cordero to and from the track from training leading up to the race and was treated like a full-fledged member of the team by all his connections. Even horse owner Burt Bacharach used to stop Ray and ask how the big horse was doing. After Slew O’ Gold was beaten in a controversial finish involving a lengthy inquiry, Ray was invited to the after party in Beverly Hills. He remembers meeting part owner actor Albert Finney outside and sharing champagne right from the bottle as if they had won. This despite not only a bitter defeat but a steward’s decision that didn’t go their way. Imagine had they won. When the day of “The Great Match” arrived, Belmont Park was filled with the electric atmosphere reserved for Super Bowls and the great Heavyweight Championship fights of the past. The place was packed and the anticipation was intense. Everyone was anxious for the 8th race on the card, the $350,000.00 purse Match Race. That was a sizeable purse back in 1975, especially with only two horses sharing in it. This was never really about money though. 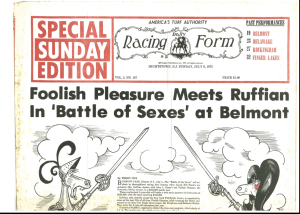 Sure, The New York Racing Association wanted to capitalize on the “Battle of the Sexes”, and the whole women’s liberation movement, but this race and everything leading up to it took on a life of it’s own. If you think the racing community anticipated the Zenyatta vs. Rachel Alexandra face off that never happened in The Apple Blossom at historic Oaklawn Park, I assure you it pales in comparison to the excitement and atmosphere leading up to The Great Match. And that wasn’t a Match Race, which generated an added level of intensity. It equaled and even exceeded the excitement leading up to The Belmont Stakes with a Triple Crown on the line. We waited 37 years for another Triple Crown winner after Affirmed, and despite all the failed attempts in between, the only horse and race to even come close to the electric atmosphere of The Great Match was when American Pharoah turned for home in The Belmont, and we all knew he was going to finally get the job done. Almost everyone involved in the aftermath of what was too happen was at the track to watch the race. One notable exception was Ray DeStefano. Ray decided to avoid the crowd and watch the race from his home, which was very close to the track. One of the more interesting things I find about Ray is, despite his love, knowledge, and respect of this great game, he has never bet on a horse. Not even once. All he’s done he’s done out of his love for the Thoroughbred and The Sport of Kings. 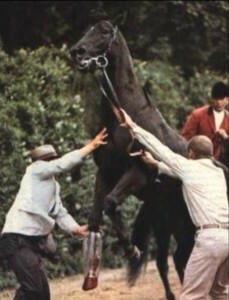 Ruffian got no more worked up in the paddock than usual. She was a headstrong filly who liked to run and she did normally get a little keyed up in the paddock. By the time she was on the racetrack, she was settled. Frank Calvarese loaded her into the third stall inside of Foolish Pleasure’s stall which was the fourth. Because this was a match race, even though Ruffian was #1, the first two stalls were left vacant. Frank could hear the crowd noise from the backstretch. It was time. As soon as the gate sprang open, Ruffian ducked in a bit and lightly brushed her left side against the gate. It only slightly affected the start, and she was off in good order but not in her customary spot on the lead. Frank had seen horses come out of the gate that way countless times before, he did not think it was nearly severe enough to cause any type of injury. Jacinto Vasquez straightened her out immediately but it took Ruffian a few strides to get up to her normal cruising speed and put her head out in front where she was used to being. Frank watched the race and very shortly into it heard the crowd roar and immediately noticed Ruffian had broken down and Jacinto Vasquez was trying to pull her up, as Braulio Baeza and Foolish Pleasure continued down the backstretch. Frank immediately jumped into the patrol truck with track veterinarian, Dr. Manuel Gilman and they rushed to get to Ruffian. By the time they arrived, Jacinto Vasquez had stopped Ruffian and dismounted. He was helping keep her calm and standing while waiting for help. The Match Race is readily available on You Tube for those who wish to see it. I elected not to include it in this article. Frank could see right away the injury was severe, Ruffian was in pain and confused, but knew they were there to help and was still cooperative despite her obvious distress. He said she was a smart filly. He noticed the wound was a compound fracture and that it was contaminated with dirt from the racetrack. It looked bad, and there was never a good prognosis. The horse ambulance arrived, driven by Horace “Blue” Rapleyea. Horace did many things on the racetrack, driving the horse ambulance was just one of them. In true Damon Runyan form, Horace touted horses, clocked horses, and got involved in just about everything on the backstretch and the front side as well. Perhaps he was most well known for his racetrack quotes like “you couldn’t find that horse with a flashlight”. Frank knew the injury was bad but also knew that they’d try to save Ruffian if at all possible. He had never seen a horse survive such an injury and assumed the horse ambulance would go directly to Dr. Reed’s hospital which was a quarter mile away. That’s not where it went. He held Ruffian and tried to keep her up and calm as Dr. Gilman put on a blow up cast. Ruffian was getting worse and getting more worked up and less cooperative. She was in distress and confused and Frank could see it in her eyes. He could see the blood and dirt through the cast which was clear. He helped load Ruffian onto the ambulance and watched it drive off. That was the last time he saw her. Being there that day, as well as for all but one of Ruffian’s other races, being a student of the game, being an animal lover, and being a huge fan of Ruffian, Jacinto Vasquez, and The Sport of Kings, made my conversation with Jacinto so poignant, yet compelling. Poignant for obvious reasons, but compelling because I do not believe it’s ever been told this way before. Jacinto was very confidant going into the race. He had won The Kentucky Derby on Foolish Pleasure, and was the regular rider of Ruffian, and didn’t think Foolish Pleasure could beat her. He didn’t think anyone could. She had too much speed, too much class, and even too much stamina. Although she’d usually run on the lead, Jacinto felt if anyone wanted or even could outgun her early, she’d sit off them and eat them up when it counted. She was just that good. 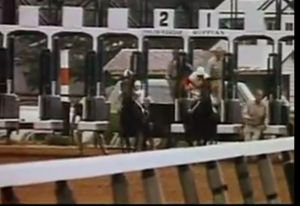 Jacinto told me Ruffian did break inward just a bit and brush the gate as it opened. This is clearly visible in the head on view of the race. He immediately straightened her out and she felt fine. There was absolutely nothing that felt even a tad off with her. The break did allow Foolish Pleasure and Baeza to be in front for a second or two. Baeza, being a very heady rider saw the advantage right away and immediately started to lay all over the filly with the colt. Jacinto knew Ruffian was bigger and stronger and neither she nor he was going to be intimidated. He got Ruffian a neck in front quickly, and the two horses and riders were in an all-out duel going at each other. Jacinto felt once in front Ruffian would never let anyone pass her so he laid right back onto the colt and they both were going at it in a him or me style. “Hey, it was a match race, it’s him or me, and I knew my filly wouldn’t be intimated”. He started leaning on me so I leaned right back out on him”. Ruffian was starting to inch ahead and Baeza was urging Foolish Pleasure to keep up. The first quarter mile went in a blazing 22:1. Shortly after that it happened. The unthinkable. Jacinto heard and felt it simultaneously. There was a loud pop and the filly was off stride. Foolish Pleasure raced away and Jacinto used every ounce of his strength to get Ruffian to the outside and stopped. He stopped her in an incredibly short time given the speed she was going at the momentum she had. He jumped off, tried to keep her up which he was able to do, tried to comfort her which was all but impossible, and waited for help. Jacinto was heartbroken and disgusted at the same time. He never wanted the Match Race and felt it was pointless. He knew Ruffian could fill the stands anytime and the so called “Great Match” served no purpose. He knew it was bad. He could see bone, blood, and dirt. Of course while life still exists we instinctively hope for the best, but Jacinto knew Ruffian was in big trouble. He still hoped. Everyone did. Frank Whiteley Jr. was watching in the stands. He knew it was bad and immediately starting running towards the track to race to his filly. He was stopped by security as Foolish Pleasure was still running on the track. Dr. Jim Prendergast, Ruffian’s regular veterinarian, who knew her medically better than anyone, was there and started to head towards the accident. He saw Frank Whiteley and drove him to the scene. Mike Bell was desperate to get to the filly and managed to avoid track security and run to her. Mike rode back to the barn in the horse ambulance with her. So did Frank Whiteley, and Ruffian’s groom, Dan Williams, who made his way to the scene. As opposed to euthanizing her right on the track, because of who she was, and maybe in part because they just could not bear to see things end this way, they took Ruffian back to Whiteley’s barn and her stall to see if she could be saved and further assess the situation. Ray DeStefano, who was watching from home, could hear the crowd roar from his house and immediately figured she’d wind up at Dr. Reed’s hospital, so he raced there. Mike Bell describes the scene back at the barn as chaotic and desperate. Dr. Prendergast was there, as was Dr. Alex Harthill who was an equine surgeon from Kentucky at the race as a guest of the Janneys and Mr. Whiteley. Dr. Edward Keefer was called. He was not a veterinarian, but a Cardiovascular Surgeon who had experience with horses and was somewhat of a pioneer in the field of medicine. He was responsible for devising the first artificial leg for the fast New York sprinter, Spanish Riddle. He was also on the surgical team who saved the life of Hoist the Flag. Stuart Janney, looking for any help he could get, asked Dr. Keefer to assist. Dr. Keefer agreed to head to Dr. Reed’s hospital. They tried successfully to get Ruffian’s leg into ice to try and stop the bleeding and also gave her sedatives and coagulants. She was going deeper into shock, dehydrating, and getting more and more worked up. The inside of the blow up cast ruptured from the pressure of the blood inside. Another one was ordered by Dr. Gilman and put on while waiting for Dr. Prendergast’s radiographs. Ruffian was trying to lie down which is not what they wanted at that point. Dr. Harthill along with Frank Whiteley and Mike Bell were trying to keep her up. They gave her antibiotics and more sedatives but she continued on a downhill path and at no point did things look good or even improve. Dr. Prendergast’s radiographs confirmed what all just about knew , the sesamoids, both of them, in Ruffian’s right front leg were shattered. 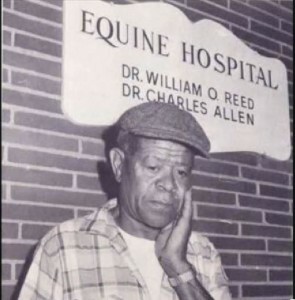 Dr. Reed was a premier equine surgeon, and his hospital was at the time state of the art. With Dr. Reed’s hospital so close, and a dream team ready to try everything, they decided to attempt to save the filly’s life. Everyone knew it was a longshot, 99-1, but she was worth it. Any horse or animal is worth it in reality, especially to that animal, but this was a different scenario than most. Although the situation looked so bleak, and it would take a near miracle or actual miracle to succeed, nobody wanted to accept this ending. Almost instinctively everyone wanted to know all that could have been done was done, and the team to get it done if any could, was in place. Nobody could have known fate had already made its decision. Ray DeStefano was waiting with Dr. Reed and his associate Dr. Allen at Dr. Reed’s hospital on Plainfield Avenue when Ruffian arrived. It was about an hour and a half post-accident. Ruffian looked bad to Ray. She looked scared coming off the van and was wobbly. She was shaky on her feet and Ray could see dirt mixed with blood through the clear cast. Usually Ray would prep the horses for surgery, which would include cleaning the wound. Ruffian was not prepped. She was taken directly into surgery. The operating room at Dr. Reed’s hospital was maybe 35 feet by 35 feet. The recovery room which was adjoined to the operating room and separated by a hinged door, that operated similar to an oven door, was smaller than that. Neither had windows where people could have gathered to watch what was going on. There were some doors in the hospital with small windows, but generally these areas were off limits and the windows would not provide a view for the goings on. Ruffian was put on the table on her left side. Ray strapped her legs to the operating table after she was anesthetized, with her right leg, the injured one, propped up. Dr. Harthill and Dr. Reed led the surgical team, they were assisted by Dr. Prendergast and Dr. Allen. Dr. Thomas Gorman, who was also a veterinarian for Mr. Whiteley, worked the anesthesia gauges. 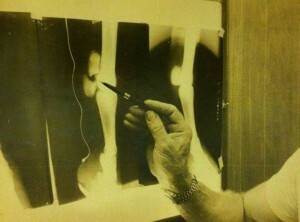 Dr. Keefer built a special type of shoe with a brace attached to it and the actual cast was affixed to that. “Muscles” a man whose real name I do not know was also at the hospital. He lived at the hospital and helped Dr. Reed make his rounds and any other way he could. He was also somewhat of an icon back then around Belmont. It was hoped the shoe and brace would give her the stability to get up following the surgery. It’s important for a horse to be able to get up and bear some weight following surgery. Back then there were no slings, or water or advanced techniques like the ones available today. The surgery took several hours. It was not an easy ordeal for this champion racehorse even anesthetized. She flat lined twice on the table and had to be brought back. It was about 1:00 am when the surgery was over. They were able to repair the shattered sesamoids but were far from out of the woods. There was the possibility of infection, there was a chance she would not be able to bear weight and get up, there was a chance she’d re-injure the ankle getting up or during recovery. They were a long way from home and likely all were mentally and physically exhausted. During the surgery there were no updates being given to the press. The focus was on Ruffian. Nobody other than who was discussed here was allowed in, and nobody was watching through any windows. The Janneys were advised of the situation by Dr. Harthill after the operation. Things were about to go from bad to worse. Ruffian was carefully slid into the recovery room by Dr. Prendergast, Ray, and others. The operating table tilted, and Ruffian was slid in a very controlled manner on her left side to where the operating table met the oven like door of the recovery room as designed. She was carefully put in the recovery room, but not yet awake. The wall separating the operating room and the recovery room was closed, again like an oven door would close on it’s hinges. Ray and Dr. Prendergast were left to care for Ruffian. Nobody else, just the two of them. Dr. Harthill went to update the Janneys. Dr. Reed was standing by to monitor progress as was Dr. Harthill. Ruffian, alone with Ray and Dr. Prendergast, began to wake up. She looked uncomfortable and frustrated. She looked to Ray like she was confused and did not like her surroundings. She tried to get up but couldn’t. She quickly became agitated and kept trying. Initially they hoped and wanted her to be able to get up. It never looked as though she’d be able to. Once they saw she couldn’t and that her continued efforts seemed to be aggravating her, and getting her worked up into almost a panic state, concern set in. They tried to calm and sedate her. The drugs available back then were limited. They didn’t work. Ruffian became more and more worked up and kept trying to get up. Eventually she started kicking and thrashing and things became very violent. She was not running, or trying to run, as has been reported. She was kicking and thrashing and struggling with her predicament. Primarily she was trying to instinctively get up. She didn’t think she was still racing as has been said. She was panicking and in shock. Dr. Reed and Dr. Harthill would come in periodically, no doubt hearing the commotion, and did not like what they were seeing. Ray and Dr. Prendergast were trying to hold Ruffian down at this point and keep her calm. It was fruitless. The more they tried, the worse she got. She never did get up. Things got so violently bad that Ruffian was doing pinwheels on the floor trying to rise. She was kicking her front leg so hard the cast was hitting the elbow on that same leg and doing visible damage. The cast was also sliding down the leg and starting to come off. Her eyes looked wild and frightened. Nobody but Dr. Reed and Dr. Harthill came into the recovery room and saw what Ray and Dr. Prendergast were dealing with. Again there were no windows where anyone could see what was going on. Nobody was bouncing off the walls. If everyone who claimed to stop in the operating room, or recovery room, actually did, they would have had to have the operation at a much bigger hospital. It just didn’t happen that way. By the time Dr. Reed made his final check on Ruffian’s progress, the situation was grave. The cast was kicked down far enough to expose the wound, and it was obvious she had damaged all the repairs that were made. The elbow on the leg was also damaged. Dr. Reed stated something to the effect of the Janneys had to be called. Ray didn’t know whether Dr. Harthill or Dr. Reed would make that call, but he knew what it meant. He sat on Ruffian’s head and neck with Dr. Prendergast and tried to keep her as still and calm as possible. Dr. Reed returned with a large syringe, already pre-filled. As Ray and Dr. Prendergast sat lovingly on the filly, Dr. Reed did what he had to and gave her the injection. Within 5 to 10 seconds she was gone, and so was an irreplaceable part of The Sport of Kings. “Setting the record straight. My job was to help position Ruffian for the anesthesia (so she would go down in the correct position on the operating table) and secure her legs to the operating table once out. I did not stand around like a tourist during the operation but, as I said, kept the floor clean of bloody gauze or anything else that may have fallen to the floor at the feet of the surgeons. I would get anything that was needed by the surgeons as I knew where everything was. Then I helped slide her into the recovery room and stayed in there with her and Jim the entire time”. Dr. Prendergast told me he wished they had more drugs at their disposal back then. Unfortunately, they didn’t, and what they had wasn’t working. It may not have made a difference in the long run, but she may have had a better chance. Usually it takes almost 30 seconds to euthanize a horse. Her rapid heartbeat and adrenaline sped up the process to about 5 to 10 seconds. She was surrounded by dedicated professionals, who not only loved what they did, but loved her. They were also the best at what they did, from Frank Whiteley Jr. her trainer, to Mike Bell his foreman and the Whiteley team, to Dr. Keefer, to all the veterinarians involved; Dr. Gilman, Dr. Prendergast, Dr. Reed, Dr. Allen, Dr. Gorman, Dr. Harthill, to Frank Calvarese her starter, to Ray DeStefano and the special role he played, to Jacinto Vasquez, her regular rider and partner that fateful day, to Dan Williams her groom. Fate can be cruel and merciless. There have been many theories about what caused this blackest of days for our game. It’s likely none of them caused the accident. It was a bad step, it just happened, it’s the saddest part of our game. Some people have speculated she hurt herself coming out of the gate. Well, one of the best gate people ever, disagrees, and he was in the gate with her, and saw what happened to her happen to literally hundreds of other horses. It rarely causes an injury, especially a severe one. It happens every race day. Jacinto Vasquez also disagrees. She felt fine after he straightened her out. She was able to run a 22 quarter, he felt absolutely nothing amiss, and knew the filly well. Some blame birds on the track. This is another common occurrence and watching the head on gives no credence I can see to this theory. Ruffian saw plenty of birds, the one that flew across the track in front of her didn’t seem to spook her at all. I’ve heard and read people talk about the configuration of the Belmont chute and how it causes horses to cross over three different sets of dirt going a mile and a quarter, The Match Race distance. That sounds like nonsense. Just watch a 6 ½ furlong race down the Santa Anita hill. Horses cross over from turf to dirt and back to turf while turning for home. They are usually running around 44 second half miles when they do it. They lose their footing at times, but few break down because of it. The Belmont configuration is much less severe. Some people think Native Dancer bred weak boned horses. I discussed this with Dr. Prendergast. We are in agreement Native Dancer bred his share of sound horses with good bones. Two things I personally find interesting, that have not been discussed much if at all, is that Ruffian’s sire Reviewer, and her dam, Shenanigans both died while anesthetized during operations. Dr. Prendergast brought this to my attention. While he agrees it is odd, Ruffian did not really suffer a reaction to anesthesia. If anything, attempts to sedate her and calm her with drugs failed. Is there a connection? possibly, but only remotely possible. Ray and Dr. Prendergast described in detail, and with consistency what happened and how she seemed to work herself up and become more and more agitated. Being headstrong and independent, and strong willed probably hurt her as much as anything. I don’t think it was a drug reaction and like Dr. Prendergast, I wish they had had more tools at their disposal. They didn’t. It wasn’t drugs that stopped her from getting up, and it was not being able to get up, shock, and likely pain, that caused her to get frantic. Some point out the track was hard and fast that day in anticipation of The Match Race. While it is difficult if not impossible to argue against that being contributory, we’ll just never know. It could have been, but on the flip side horses run over hard, fast tracks on big days all the time. A bad step can occur over any surface at any time. Some have said she awoke thinking she was racing as that was the last thing she remembered, and started running. Well we know the running never happened, and plenty did happen after the race. The race is probably not the last thing she remembered. She was smart, and Frank Calvarese, one of the first to get to her told me she knew they were there to help. I’d like to think that’s the last thing she remembered, people trying to help her. Match races are stressful. Horses are naturally herd animals, and a race scenario is different than a work out scenario. Was Ruffian more keyed up than usual? Maybe, but would that cause what happened? Likely not. I discussed this theory in depth with Bruno De Julio, a clocker, handicapper, owner, breeder, and avid watcher of horses and their body language. He agrees they are indeed herd animals by nature, and that a match race scenario can get a horse more keyed up than perhaps they’d get in a regular race, but is that enough to theorize it was contributory? No, it just isn’t. Sometimes we look for answers when there are none. All 1’s went to 99-1 as soon she took that misstep and shattered her sesamoids. The best veterinarians and team of horsemen, and even a brilliant and innovative cardiovascular surgeon couldn’t change fate’s mind, and they sure tried. As sad a day as it was for our game, it was also a display of love and dedication to the game and this magnificent horse in what was done and attempted in trying to save her life. And make no mistake, it was love of the breed, game, and her, that prompted the efforts. You’ll hear organizations like PETA and others criticize our game and accuse us of not loving our horses. I’m an animal lover and rescuer, and also a fan and student of this great game and I think many of us take exception to insinuations we don’t love our racehorses. There are bad people and uncaring people in every business and every walk of life and our game is no exception. Ruffian was buried in the Belmont infield the next day. Frank Whiteley Jr. was there, Mike Bell was there and actually helped get her down into the grave they dug for her, and made sure the Locust Hill Farm blanket was straight. Jacinto Vasquez was there. There were a few other people there Mike doesn’t remember but it was a small and select and somber crowd, most of which were her people. Horse racing offers the highest highs and the lowest lows. Ruffian was an example of both in one. All 1’s. I’d like to personally thank Raymond DeStefano for choosing me for the honor and privilege of writing this accurate account of what happened and what didn’t happen. He was also instrumental in gathering information and providing me with pictures of items he has saved since that fateful day. I’d also like to thank Dr. Jim Prendergast, a great veterinarian, and an animal lover, for his time and graciousness and help with this article. I’d like to thank Mike Bell for his time and courtesy and for making himself available every step of the way. I’d like to thank Frank Calvarese for spending as much time talking with me as he did and offering all the help he could. I’d like to thank Hall of Famer Jacinto Vasquez for providing me a play by play open, honest analysis and account of what happened. I’ve never read or heard such a detailed account from him anywhere else. I’m very appreciative. Last but not least, I’d like to thank Ruffian, for the memories she gave me. I hope I did her justice. Beautiful. Poignant. And almost unbearable to read at times. I have a picture of her in all her glory in my office. She was one of a kind. Thank you for sharing this beautiful piece. Thank you Cynthia, it wasn’t easy to write, and yes she was one of a kind. Thank you Mack, I really appreciate that. Much obliged. Great article but geez, can those photos be any smaller? Thanks. The pictures are old and distort when enlarged. Believe me we tried. Very well written Jon! Great read! Thank you Troy, I appreciate it. Beautifully written. Probably the best and most completely detailed account of that sad day. I’ve read several different stories of the events after she broke down and I always find myself hoping she makes it. Thank you for the time and effort it took to write this article. Thank you Roger, it was tough to write, but one of primary reasons was to tell it as it really was and clear up a lot of misconceptions. Absolutely great article! I was extremely exhausted from work before reading this article, but just could not stop! Very emotional for me the day it happened, I will never forget the sadness that me and my dad felt! Thank You! Thank you James. it was a sad day indeed, but I think it was important to get the real story of what happened out there. Yes, one of a kind. Thank you. Jonathan, thank you sharing this story – undeniably the most accurate and honest depiction of Ruffian’s last hours that I’ve read. Your piece is so very well crafted and polished to a shine with photos and first-hand accounts. Tears came to my eyes at several points and no more than in reading this line…”I’d like to think that’s the last thing she remembered, people trying to help her.” Thank you for caring. Thank you Eric. I really appreciate your kind words. And I so hope those were her last memories. Great story, well told. It was before I was interested in racing, so it was all new to me. I am friends with the ” iconic Jimmy Dailys” sister, and she spotted his picture immediately. Made her day. Do you know what paper that picture was from? Congratulations on another fascinating piece. Thanks Pat. I am not sure but will find out. You can tell Jim’s sister he was very kind to me when I was a young boy and summered at Saratoga. They used to have a small paddock across from the walking ring where I used to sit with my Mom, and Jim would let me pet and hold his horse and explained lots of things to me. He really was a great guy. I looked forward to those summers and eventually we used to see each other back downstate and he was always great. Of course he was also quite the outrider. I found your piece interesting at times, but strangely disconnected from some realities of that period in New York racing and The Great Match Race. Many of the insights shared by others who were located elsewhere added to my own knowledge because I was working a radio broadcast at the track July 6, 1975. However, at about 6:30PM I drove over to Reed’s hospital to see if I could help, and did participate in that evening’s disastrous effort to save Ruffian. Among other things I held her urine catheter in place during surgery. Without going over every detail I find fault with in your retelling of events, I do want you to know one thing: Ruffian came out of anesthesia paddling, or RUNNING at speed on her side. I guess Ray was there, though I don’t remember him, and I know Dr. Prendergast and Blue were trying to stop her movement by sitting on her head and pulling her tail. I walked out of there to sadly drive home at 3:00AM. Marshall, I know who you are and I certainly don’t want to argue with you. I don’t have a clue what you mean by strangely disconnected from certain realities of New York Racing at that time or The Great Match, so I can’t respond to that comment. I practically grew up on NYRA tracks. I am 110% certain and comfortable with what I described in the recovery room, and who was present. It was not Blue and Dr. Prendergast, it was Ray and Dr. Prendergast, and both of their detailed descriptions were pretty much identical. I did a lot of research, spoke to everyone in the article, and I am comfortable with what I wrote, as are the people who are in it. There was no way to see into the recovery room so to say “you know” just lacks credibility. She did not come out of anesthesia running, she tried to get up, couldn’t and began to get worked up and things worsened from there. Again I don’t want to argue, I think you were a great caller, but clearing up the story about her waking up running was one of the reasons the article was done. As you wrote, one of the reasons for your writing this piece was to clear up the incorrect thought that Ruffian awoke running. That is one of the reasons I submitted a response. Another reason for my response was your energetic suggestion only those people mentioned were present that awful Sunday night. No serious problem on either count, but both assertions are factually in error by my observations. In fact David Whiteley sat on the floor next to his father, both their backs against the operating room wall for the surgery’s entirety. There were no comfortable chairs available and they sat mute witness. I believe you are correct in suggesting there were no news conferences or press releases that evening; but, when I stepped outside for a smoke after surgery, I was hailed by Win Eliot who had sat in his car that long just because he cared. Win worked for WCBS radio and I told him what little I knew. No, there was no organized delivery of information to the media, but one member of the radio medium wanted to know how Ruffian was doing, and waited alone in his car until late at night to learn. That counts, too. After rereading ‘”All 1’s” Ruffian, The Real Story,’ I think you have successfully captured the essence of her life. Congratulations! Thank you Marshall. I realize there were other people present, I was specifically referring to the OR and recovery room. I was not made aware of Mr. Eliot and agree that counts too. I appreciate you re reading the article and am really glad you like it. I grew up a fan of yours as a race caller and can still hear your voice in my head. I was at many a famous race you called, and think you were one of the best. Thank you again. With all due respect, it was Dr. Prendergast and myself in the recovery room the entire time from when Ruffian was slide into it until Dr. Reed came in to euthanize her. It absolutely was not Horace “Blue” Rapelyea. The reason why I agreed to this story is that I have read too many stories and watched a ridiculous movie that all were very inaccurate. Sorry to ruffle the feathers, but I am confident I saw Blue on her head. Perhaps he spelled you and I caught that scene only; I don’t know. As to the described completeness of the recovery room enclosure design, I also don’t remember the placement of one whole movable wall that could have been raised and lowered. What I do remember is seeing Ruffian running on her side and her hind right hoof annihilating the surgery’s resultant cast and her foreleg. And I remember seeing the abject futility upon so many faces in that hospital including Dr. Prendergast’s. Once again, I didn’t intend to cast doubt upon your observations, but only to add my own perspectives that were complete, I thought. I apologize for unintended effects. On the plus side, I am so glad to read you are an important part of Jonathan Stettin’s review. 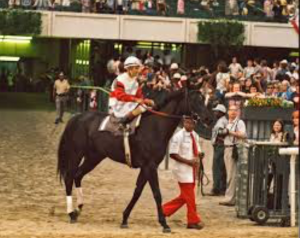 Ruffian was a once-in-a-lifetime star for Racing! What a loss! I learned things I didn’t know. Thank yyou. I’m 70 years old. The love of horses and the sport has been life long. I’ll certainly never forget that day. Final note on the recovery room. I spent many hours in that recovery room with horses coming out of anesthesia. That was my job after assisting in surgeries anyway I was asked too. Why would Dr. Prendergast be in there with “Blue” (certainly a nice man), who was a clocker and ambulance driver…but not a horseman, over someone with a lot of experience with that situation (especially with a horse with such a great reputation)? I was 13 the day of the Match. I cried when I saw Ruffian break down, and cried even more after the surgery and her subsequent putting down. I’ve read almost every account of her life, and I find comfort in the fact that she had good people around her, even til the end. Thank you for your story! It was most interesting, and as another reader wrote, I was hoping for a different ending. But she’s gone, but still so very loved by her adoring fans. Thank you for sharing the truth! Thank you Denise. And yes she was surrounded by truly good people. Marshall…again, with all due respect, it was not Blue and Dr. Prendergast sitting on her in the recovery room. Ask Dr. Prendergast if you would like. Why would I even say that I was in there with her and Dr. Prendergast if I really wasn’t? Dr. Prendergast concurred during his interview with Mr. Stettin. This is why I agreed to do the story after a long time. There were too many untruths/misconception/fabrications about her last hours and I really wanted to get them straight. I stand by my story. Wonderful article! So happy to see my brother ,Jim Dailey, pictured. We had always known that Jim was right there when that terrible accident occurred. 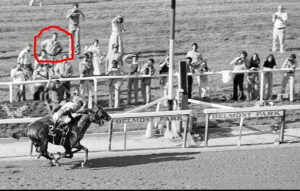 My husband seems to remember seeing a photo in the newspaper of Jim holding Ruffian on the backstretch following the accident. Do you? Thank you for your kind comments re: Jimmy during your younger years in Saratoga. It certainly sounds like him. Do you know ,also, that the trainer, Wesley Ward, is Jimmy’s grandson? Hi Jeanne, Yes I did know Wesley was his grandson. I remember seeing the picture your husband refers too. I could not find it for the article. It would not be like Jim to not be doing anything possible to help. Very fond memories of a great guy. Your brother was a class act and a very kind man to me who at first he didn’t even know. I remember my Mom telling me to leave him alone, as I was fascinated by him and his horse, and him just being so kind and taking me right into the stall. Some of my earliest memories of Saratoga. For years afterward when I would see him on the track, I’d say that’s my friend Jim. Great outrider too. Pleasure talking with you and glad you saw the article. 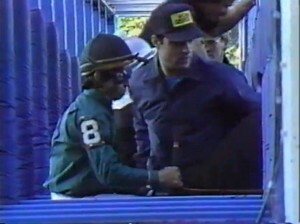 Jim Daily was the iconic NYRA outrider…and a really nice guy too. Thank you for your response. Even today, when we see a horse break through the gate and be on the loose, we say, ” Jimmy would have had him”. Thank you, and those who spoke with you, for sharing her final moments with us. I was only 15 at the time and still vividly remember where I was watching on that fateful day. Your article brought tears to my eyes, but I take comfort in knowing that she was surrounded by people who went above and beyond for this amazing filly. Raymond DeStefano, I can only imagine what it was like to be in there with her at the end, but I thank you and Dr. Pendergast for doing all you did for her. I like to think her last memories were of those she knew were trying to help her. I still have a picture of her winning the CCAO on my wall. It was sent to me by NYRA in response to a condolence letter I sent care of them to the Janney’s. I cherish it, and the memory of a great filly, to this day. Thank you for that comment Laura. To be honest, she did not know me at all. I had never done any work with he before that day. She knew Jim (Prendergast) very well as he saw her on a daily basis. Actually, as sad as it was, it was a relief when I saw Dr. Reed enter the recovery room with his syringe to euthanize her. Within seconds of the injection, she went very peacefully. Recently, I had to put my little buddy (a Maltese dog) to sleep. He was sick but not in the distress that Ruffian was in. However, it was deja vu…and I told the vet. This time I cried. Thank you Laura, much appreciated. Thank you for presenting the facts. She is still the greatest filly I’ve watched, it still hurts as desperately as it did at the time. There is no question in my mind that everyone involved in trying to save the masterpiece of a Thoroughbred she was did all they could for her. I have been privileged to know or be friends with some. The article does give some closure, because even today, it seems like it was only yesterday. May 22, 1974 I was 23 years old and happily sitting in the grandstand at Belmont . I loved 2 year old MSW races that early in the year. In the upcoming race Suzest was the talk of the “wise guys.” This filly is “special!” She was! She would have won the race by 5 lengths at least had Ruffian not been entered. The second Ruffian crossed the finish I looked to the tote board for the time of the race. 1:03 flat ties the track record. I fell in love that day! Less than 14 months later I wept uncontrollably after watching the “great match race” on TV. What happened in between was unique, totally remarkable and inspiring beyond words. Wonderful piece of writing! Thank you Clif. I appreciate it. I was there on that fateful day and remember clearly how I felt. Just like Jacinto, I wondered what the purpose of the race was, but I also understood the sacrifices made to promote the sport. It seems to me that throughout history , regardless of what venue greatness stems from, it’s always stalked by tragedy. Had it not happened on that day, it may have happened on another. I can only focus of the joy and pleasure she brought to the sport of kings and queens. Good way to focus Bob. I waited until I had a block of time set aside to read this whole thing in its entirety. Thanks for the excellent remembrance. Well done. 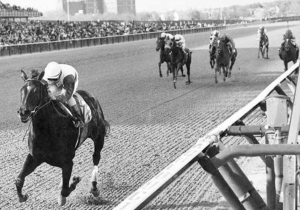 Thank you for these enlightening and poignant article about the great Ruffian. I never saw her in person but I feel like I know much more about her after reading your article. 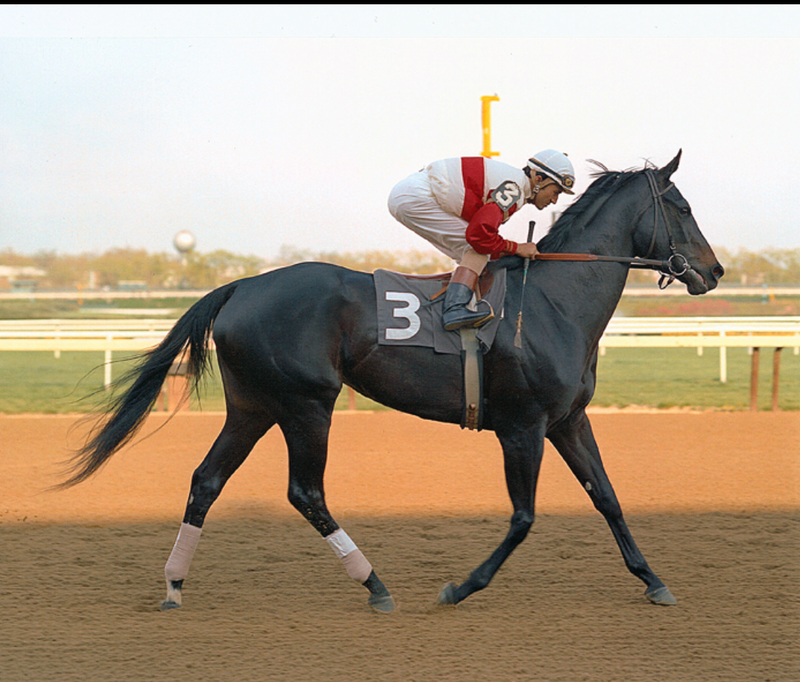 Ruffian…..i will always love you. A wonderful read,tears fall again from my eyes. That never came up in my story Tommy. I don’t remember that theory or I would have looked into it and addressed it. There were probably other theories as well. Unfortunately I think it was just a most unfortunate bad step as we see happen in our sport. thank you for your story. I will not forget that day, the sound of one set of hooves, the scene of pain and fear. The tears that people dropped. I have a print of her from the NYRA with her #3 cloth. She will always reign. Thanks Cedelia, a very sad day in our sport, but she was a magnificent horse. I have always been of the bad step theory…and always will be. I have seen MANY horses take just a bad step that led to them breaking down. There are theories of pigeons (nonsense), hitting the side of the gate as she broke (more nonsense), and the list goes on and on. One theory of her regular exercise rider (Yates Kennedy) is that she had to race on three different surfaces in the first 1/8 of a mile. Although true, I do not believe that caused the breakdown. Horses cross different surfaces all the time. The 1 1/4 chute was “resurrected” for the Great Match Race. After the start, they ran almost 1/8 of a mile (surface #1), crossed the training track (surface #2) briefly before entering the main track (surface #3). Ruffian broke down much further down the backside after entering the main track. I wanted to comment on your article for two reasons. First, I wanted to tell you that I was tremendously moved by your account of that fateful day as there was not much info given out about Ruffian’s breakdown and what corresponded afterwards. And then, as you mentioned, a lot of misinformation and rumor. Yes, I did hear the theory of the birds on the track as the cause of her accident. So, thank you to everyone involved for detailing her story and setting the record straight even though it was most hurtful to read and had me in tears. I do wonder why her connections did not have her transported directly to Dr. Reed’s Hospital instead of taking her to Mr. Whiteley’s barn first considering the magnitude of her injury. She was an awesome filly and will always be remembered for her accomplishments on the racetrack. Secondly, I did want to take the opportunity to correct one mistake made, ” Both Secretariat and Ruffian were born at Claiborne Farm”. Secretariat was foaled at Mr. Chenery’s Meadow Stables in Caroline County, Virginia. In fact, I will be traveling to “The Meadow” on April 2nd to celebrate his birthday, which is now an annual event at The Meadow Event Park. Secretariat’s grave site is located at Claiborne Farm. Thank you for your time and the attention you gave in delivering this riveting and moving story of the great Ruffian. Thank you Marlene. Interestingly I wondered that same thing myself. I believe, the situation was grave enough that the expectation, not the hope necessarily, was she would be euthanized at the barn. At some point they decided to try and save her against the odds. I don’t know that to be the case, but it was the impression I got. Thank you again. Thank you for writing this article! It was really quite riveting. I only wish the pictures were clickable to make them bigger! I was never able to see any of Ruffian’s races, as I was born in December of 1975, but after finding her and reading her story (namely Burning from the Start), I was hooked. She really was just awesome. As a model horse collector, because I can’t afford a real horse, I’ve wanted to get a portrait of Ruffian done on a model horse. However, there are some differences in opinion as to some of her features. For instance, were all four of her hooves grey/dark color? One person I saw online had a Ruffian portrait one, with the left rear hoof being tan. I couldn’t tell from the pictures if all four were the same color or not. Also, to be honest, I’m forever searching for good images of her left rear leg. That amazing white marking around her ankle is something I can never find accurate pictures of. Usually they’re pretty blurry, or don’t show the whole leg/hoof. Do you know of anyone who might have pictures that might be online? Anyway, thank you for sharing your memories. It really fills in some of the gaps. For one, I never thought the birds bothered her. She was a professional athlete, and I doubt they would’ve bothered her much at all. I’d always thought it was something with the gate as she left it. Thanks Jenn. Actually I had trouble with the pictures. Because they were so old, and technology was different, it was hard to enlarge or enhance them. I had to work with what we had so to speak. I wish we could have enlarged them. I did come across a site that had a bunch of private pictures of her, all old and of poor quality but you might find one or two that interest you. I will try and find it again and send it to you. Thank you for your comment and for reading it. What a great piece! I have never read such a comprehensive story about Ruffian, and told from such a unique perspective. I was a sophomore in high school and just getting into the sport of horseracing when I saw this horse name Secretariat do some pretty incredible things in 1973. I thought that this must be the greatest sport ever! Over the next couple of years, I couldn’t get enough of the sport. I literally wish the year away to get back to Saratoga. And came that fateful day in July 1975, as it is etched indelibly in my mind forever. I have always been thankful that I was not there in person. I thought that the Match Race in it’s concept was stupid. There was no betting value per se, and one race between the two would no way definitively tell which horse was “better”. 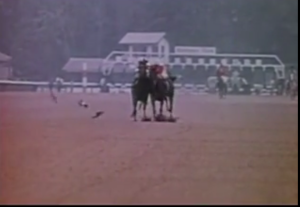 Each time I see a horse breakdown, I am mediately have flashbacks to Ruffian. I started to think that perhaps this was a cruel sport to the animal, and maybe I should try satisfy my gambling action needs else where. Fortunately, as I was pondering the future of horse racing in my life, along came a couple of horses named Seattle Slew, Alydar and Affirmed. My interest in the sport was renewed, and I have never look back over the past 40 years with any regret. I understand that horses breaking down is part of the game, and although as difficult as it is to accept, it is far too uncomfortably easy for most players to turn the racing form page and move onto the next race. Your article tells an in-depth story of all the players that surrounded Ruffian, the emotion, the panic, the confusion in the intense personal relationship people have with the horse that most players do not usually see. 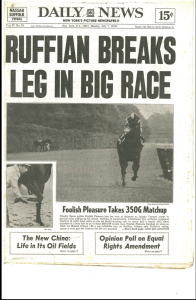 I have seen movies about Secretariat and Seabisket and others, and read books about other horses, But I had never really read a comprehensive story on Ruffian. Your writing was riveting and detailed to the point before you can almost feel yourself in that situation. Thank you very much Kevin. I am glad you appreciated it, and took the time to share your thoughts. It was a rough day, and rough to write, but the real story needed to be told, and thanks to Ray and the others I was able to. I just hope I did her and all them justice. Thanks again. Absolutely the most heartfelt story I have ever read . Being an owner of thoroughbreds I must reiterate what you wrote … we truly do love our horses and treat them just at well as we do our children ! My heart breaks for Ruffian and her team. This is my biggest fear and worst nightmare . Thanks again for such an eloquent article. Thank you Judi, I appreciate it. I followed Ruffian’s three year old career as a youngster. Each time I watched her race a chill ran down my spine. The way she looked and the way she ran was unreal. Each time l felt as if I were watching a movie. I cried when she broke down but at the time I thought she would survive. I was devastated the next morning when I discovered she’d been euthanized. Over the years I’ve seen many articles about her. I’ve read opinions by clueless, vicious people that she was overrated. Pure nonsense. Even Secretariat’s trainer, Lucien Lauren, told the press that he felt she might be better than Secretariat. He should know. I believe she was. This article is a fitting tribute to the best Thoroughbred filly ever. You gave Ruffian her due, and I thank you for that. Even after all these years I am still in awe of her but that last day brings tears to my eyes. What a great article and so well written. I was to young to know anything about horse racing back then but once my interest in the sport peaked in the late 70’s that is all that encompassed my free time. 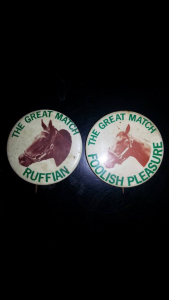 I watched everything and anything I can get my hands on when it comes to the great Ruffian and Secretariat and boy do I wish I was older back then to have seen them live. While reading your article I felt like I was in that tragic moment living the events as they happened, it brought tears to my eyes. Lets hope someday we get to see another horse with “All 1’s”. Thank you so much Damian. I really appreciate the kind words. What a beautiful accurate of a beautifully magnificent filly! About 4 years later I would go on to rub horses in 1978 at Atlantic City Race Course. I have always been in awe of this filly and tried to see her grave and hole at Belmont one winter (shipping to Aquaduct to race) but there was snow over it. Thank you so much for sharing this wonderful piece of history with fellow lovers of the game. Guess I should have proof read! I was in tears by the third paragraph…..Brilliantly written and you did the almost impossible. You did this great filly the justice she deserves. Thank you very much for your kind words Mary. I truly appreciate it. All the people i spoke with, starting with Ray DeStefano made it possible and share in any credit. Thank you so much. After reading this incredible piece about the Great One, I have the feeling of pure shock again that hit me at age ten when it happened. I can’t believe its been this long, I can’t believe that such a horse, so incredibly great, actually lived on this earth, albeit for such a short time. I can’t believe she was taken from us in such a violent, harsh way. One issue I’ve always had the strong feeling about is that someone, somewhere, has some of her mane, tail, etc. Can you only imagine? If TB’s were allowed to be artificially bred, can you IMAGINE if they took some eggs from Ruffian, and silently never said a thing? I don’t think they did that back then, but can you just think if she did not break down? What would her future have been? What races were next? Imagine the dark little foal she would have had, hoping it would be a filly since the female side were such incredible producers. I have rooms filled with Ruffian items, including an original oil painting done by an artist that was at the track that day, showing his perception of what the finish line looked like had that not happened. Its done in “surrealism” mode, since that finish line never happened. For Ruffian at least. We all know that dark big filly would have put the colt away by the turn, and gone on to keep flying, opening up the lead more and more until Jacinto had to try to slow her down and let her know the race was won. Can you advise who is still alive today of Ruffian’s people? I know Jacinto is. If so, how to write/contact in any way, them? This many years later, after reading your article, I find myself crying again for her. Over the years, I have collected anything Ruffian there is. I was lucky enough to get the actual authors book who wrote the smaller book about her, and in it was a hand typed letter on the old fashioned onion paper, along with a handwritten note, addressed to Ruffian’s veterinarian. I could not believe my eyes when I opened this up. I thought it was just the book, and then as I went through the book, all the extras were in there. I would love to donate it to the best place that represents The Great One, or sell it to a private collector. I want to make sure it gets to a place where it, too,, shall rest in peace. How could I forget? The newbies who state that zenyatta or Rachel Alexandra are better have not a clue. Ruffian had the speed of a sprinter and the endurance of a long distance runner (remember Jacinto recalling the time of taking her out to almost 2miles?) and all of that wrapped up in a show horses body. We don’t see the graceful looks of the Golden Ages TB’s anymore. Is it too much inbreeding? Probably. I don’t know. Most of them now look more Roman nosed (Zenyatta) as opposed to the delicate beautiful face of Ruffian. In fact, I had even read in a few places that when making the Ruffian movie, they could not find a horse that would match her beauty, not to mention they had to use colts to get to her size. My dream some day is to kneel at her grave and place flowers, however time is going fast and I probably will not make it. I don’t even know if they allow visitors there or not, do you? Have you been there ever…. I think I would cry my eyes out once again, as I have done many times for The Great One. Magnificent story of the Greatest Racehorse I ever saw. Thank you work you did to complete the story and clarify many points. I was 14 on the fateful day, and remember watching the race on TV and the shock of what happened. A few years later, I was in college at Kansas State University, which has a veterinary school. I had a friend in the vet school and we talked about Ruffian. This would have been about 5 years later, and they taught about her case. He mentioned some things about how she may have had an unexpected reaction to the sedatives they gave her. As you mentioned, the drugs available then were limited. At the time this happened, I thought about Ruffian and wondered if something similar had happened with her. Her body was already in severe stress and as you wrote, even the enthunasia drugs worked faster on her. The point someone made in the Comments about her sire and dam both dying under anesthesia is interesting in light of this. It doesn’t matter in the long run, she is gone and her destiny sealed. Long live her memory. Thank you for setting the record straight, as painful as it is. My heart goes out to all of Ruffians “people” and the dedication to this special filly that they were trying to save. One of the saddest days in racing ever. Excellent insight Jon, these accidents happen unfortunately as they do in all sports, the difference is other athletes take time off and play again, they’re not euthanized. 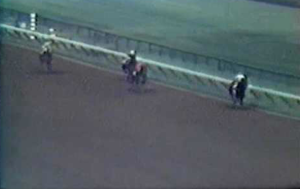 I was also watching the race (on TV) when it happened and there is no sadder sight than a jock standing next to a horse while the rest of the field is still competing. 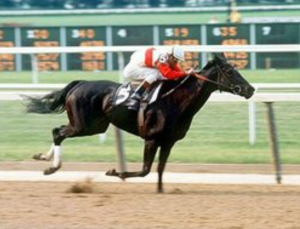 The terms “great” and “champion” are too easily thrown around today, Ruffian was a Great Champion by any definition. Thanks for the well written article. Thank you Greg. Appreciate it. Thank you for the real story! Crying such uncontrollable tears! Thank you. I appreciate that and I understand. Very sad. I worked a couple of barns over from Ruffian, the backstretch was a tight knit group in those days. Your description and writing are on point. I read it with trepidation because most people who attempt to write about racing fail miserably. That was my life and my family’s life and Elmont life. You are 100 percent accurate. I cried as I read this piece since I had so much respect for that filly and was at the race. The atmosphere was like dimming the lights on Broadway. Thank you Lisa. I appreciate that. Thank you for the wonderful tribute to Ruffian.It is comforting to know she was with wonderful people. Thank you to Raymond for his honesty and his replies to others comments. I had to turn my back on horse racing after that day and kind of buried the pain. I have finally decided to read what I can and to learn all that I can about her.I have had a difficult time getting good photos of her. I want to share with my family what an amazing horse she was and deserving to be remembered forever. Articles like yours, that help keep her memory alive are important and I thank you for that. I do have a question that I don’t know if you can answer, do you, or anyone who reads this, know why a statue has not been created for her? She is so deserving of one. The last time I heard about a statue for Ruffian was back in 2014. 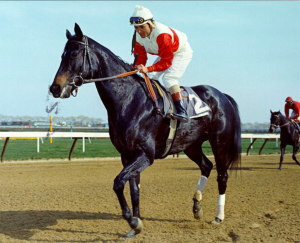 I totally agree with you, Ruffian is long overdue for a statue. 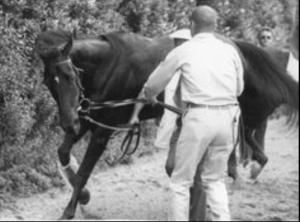 I read your article hoping to confirm my memory of an advisory trainer or owner who had mad some disputable comments regarding ruffian before the race – I’ have not found any coverage of those comments and it appears they have been wiped from or never appeared in the internet record. As I remember the person said something to the affect that Ruffian would never beat a male horse as long as he (the owner or trainer?) was alive. Do you know who that person was and where I can find his comments? Sorry Diane I am not familiar with those precise comments. Very nice insight to what really happened behind the scenes of Ruffian’s breakdown and the surgery to follow. I’ve read the comments left by others, and found some more insight there. I have to agree that today’s technologies might have saved her, but then again as high strung as she was, she might not have. One point I wanted to make and how I can relate to what Ruffian woke up to is I had a minor procedure a couple years ago. Before the anesthesia, I wasn’t in the proper position, and had to hurry up and get into that position which created some anxiety. Waking up I was fine for a bout a minute then I needed to get out of bed as I started to hyper ventilate. I was well aware of what was going on around me. So in essence, I think Ruffian still hyped up, shock, pain, anxiety etc was still going when she was placed under anesthesia, and when awaken, she might have had the same affects that I went through. On top of anxiety, Ruffian wasn’t able to get up. I read that if she could have adjusted to being injured prior to surgery for another day, things might have been different. 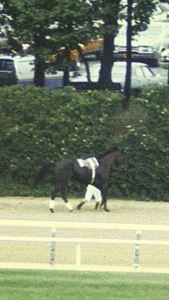 I also realized to that Ruffian didn’t tolerate a cast on her hind leg that ended her 2 yr old season. What were the thoughts of placing a heavy cast on her right foreleg? She most likely felt restricted with the heavier cast. Her freedom trimmed down some. One aspect I didn’t know was she had a dislocated fetlock. 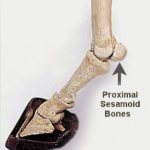 I knew about the sesamoid bones being shattered. I wish I could gain a photo of the cast that was used on her, and like someone else mentioned her left hind left markings. I’m a horse love and own horses. If I could engineer something to help horses like Ruffian and her type of breakdown, I would surely help out the equine industries. One other point to make. As it has been mentioned about soft bones with example of Ruffian, Eight Belles, Barbaro, Go for Wand, etc…look back and take a look at the horses from the early 1900’s and see the bone mass of their legs compared to thoroughbreds of today. The bones have more mass to them. As one writer mentioned that horses today run less that 20 races and they’re retired where as horses long ago ran a lot more races. Exterminator for example. He never broke down (correct me if I’m wrong), but that’s one example of many. Horses are now being bred for speed and conformation is over looked. Breeders I believe need to look as to what can improve a foal’s confirmation and not worry about the speed. One day thoroughbreds will not no longer have branches to stand upon, but twigs that will snap in a heartbeat. I would truly love to have more photos of Ruffian. Is there any photos of her as a foal? Thank you for writing a lovely piece on what I would consider one of the greatest racehorses that God has gifted us with. Greed took her away in a short time, but someday I look forward to crossing Rainbow Bridge and seeing the lovely filly and admire her even more. It may have been a factor but I am more inclined to think it was just a bad step. I agree with you Jonathan that it was a bad step. Just wish she could have been saved, but fate was against that. At least we had her for a short period of time.